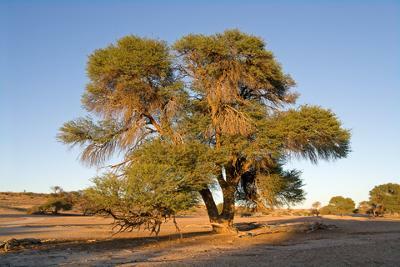 Acacia Erioloba, or the "Camelthorn Tree" is dense and slow burning, making excellent coals for cooking. Yes, I know you can't get it in Europe! But when it comes to firewood I think this one is the king. The Acacia erioloba or "camelthorn" tree is native to southern Africa and is much favoured by giraffe who browse on the upper leaves. The wood itself has a very dark red interior (the xylem) surrounded by a beige-coloured layer (phloem and cambium). Because of its hardness, it makes tremendously good coals and burns for a very long time; and the smoke gives a lovely flavour to any meat that just happens to find itself on top of the mesh. If for logs 'tis laid away. We're emigrating from the UK to a farm in France in the not-too-distant future; we'll be both heating the house and cooking using a wood stove. As for wood, I'm afraid we'll be using whatever we can find - most of the trees are birch. Hi Rob, Thanks for this. Camelthorn is not a tree I've heard of before but it sounds interesting. I'm guessing here, but it probably grows quite slowly under arid conditions which tends to lead to denser woods. Moving to France sounds great - they still have a real tradition in rural areas of harvesting and processing their own firewood and you can usually see large stack along field boundaries to get maximum wind and sun exposure. Join in and write your own page! It's easy to do. How? Simply click here to return to Firewood Tree Types.